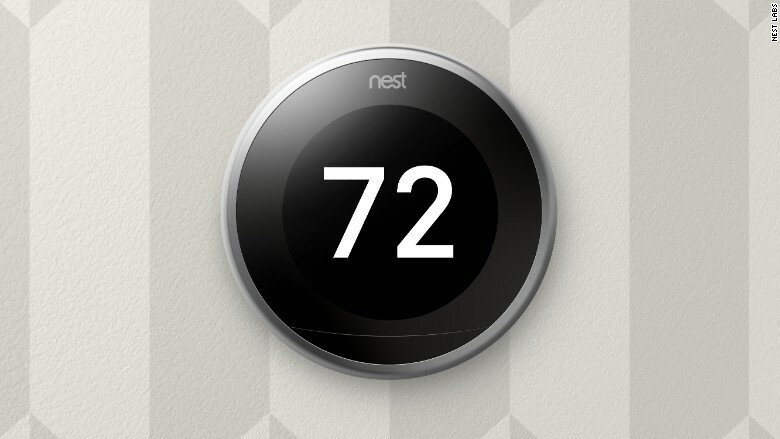 The third-generation Nest Learning Thermostat can display information, such as the current temperature or time, large enough to read across a room. Nest's popular Learning Thermostat has gotten a facelift. The new Nest thermostat is redesigned to have a slightly thinner profile, some new software tricks and a bigger, brighter, easier-to-read screen. The display on the latest Nest has been made 40% larger than the previous smart thermostat, so that owners can read the thermostat without squinting. The screen also has a 25% higher resolution. The newest Nest, which costs $249 has a new feature called Farsight, allowing the display to sense movement from far away. To save energy, the Nest's screen shuts off unless it detects motion. The previous Nest screen went dark unless you triggered its motion detector within three feet of the thermostat, but the new Farsight feature lets customers wake up the Nest even if they're across the room. The new Nest app will let customers set the Nest's default screen to display the temperature, an analog clock or a digital clock. Another new feature helps prevent customers' furnaces from overheating. The new Nest tracks heating and forced-air furnace shutoff patterns to help identify potential problems. Customers will get a notification on their Nest app twice a year and in their monthly Home Reports if the Nest detects an overheating issue. Don't be too bummed if you have an older Nest: That "Furnace Heads-Up" feature will roll out to older Nests in the next few months. The improvements may not be flashy, but the latest update is the first that the smart thermostat has gotten since 2012. That seems like forever in tech terms, but the Google-owned Nest doesn't need to do anything dramatic to its thermostat at the moment: It's well-liked, it works, and doesn't look dated. The original Nest learning thermostat was a hit when it came out in 2011. It became one of the first "smart home" devices to appeal to mainstream customers. Nest Labs was founded by a pair of former Apple (AAPL) engineers, so it was no surprise that it was beautifully designed. The glossy puck looks good on a wall and it can be controlled with a smartphone. Nest promises customers that its thermostat will save them money by tracking their heating and cooling settings over time and by learning their habits and patterns. The company claims that customers save between 10% and 12% on their heating bills and 15% on their cooling bills, on average. The smart thermostat also pairs with Nest's other gadgets. 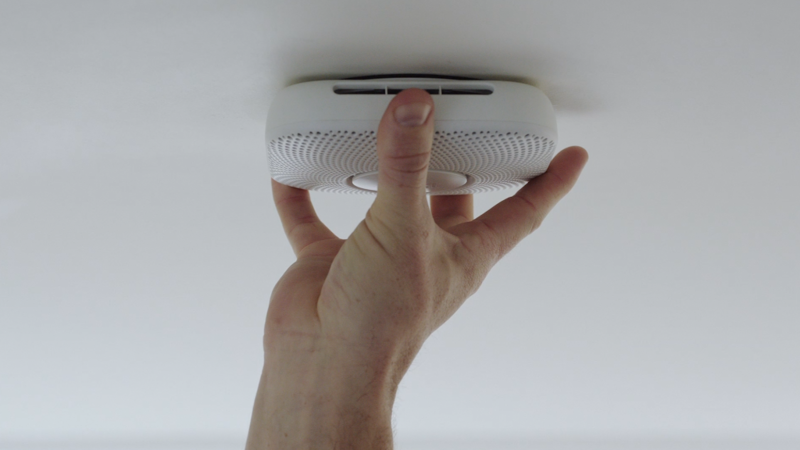 For example, the "Nest Protect" smoke detector will display smoke or carbon monoxide detection warnings on the Nest thermostat's screen. And when there's a carbon monoxide warning, the Nest thermostat can automatically shut off gas- or oil-burning furnaces, which are often the cause of a carbon monoxide leak. Though the thermostat has been widely praised, the Nest Protect smoke detector has been plagued by poor reviews. The company disabled one its best features. Nest also bought popular Wi-Fi camera company Dropcam and released a similar Nest branded camera earlier this year. The company says the new Nest thermostat will be available Tuesday on Nest.com, Amazon (AMZN) and BestBuy's (BBY) online store. It will eventually be sold at 7,000 retail locations and by certified HVAC specialists. Nest will continue to sell the previous version of the Nest for $199, but it will discontinue the older Nest once supplies run out. Google (GOOGL) bought Nest in 2014 for $3.2 billion. Nest Labs will become an independent subsidiary under Alphabet, once Google restructures later this year.